Lisa - I took a class at Michaels. I just learned the basics... how to cast on, knit, purl and bind off. It was easy enough to do a few projects. Like easy scarves and dishcloths. What got you into designing your own patterns? Lisa - I started practicing using free dishcloth patterns with pictures in them. I had designed crochet graphs previously and thought knitting them would be fun. 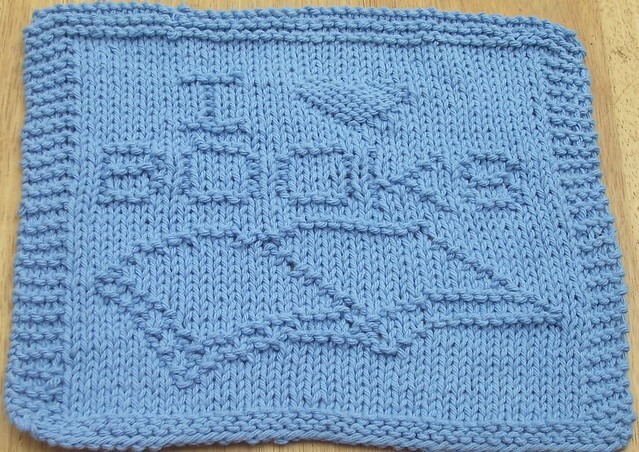 I had met a really nice knitter online who taught me how to read a graph in knits and purls. After that, I was hooked! Lisa - Everything! I get lots of requests and suggestions from people. At first I just started doing what appealed to me. As time went on, I tried to cover every category I could. How long does it take you to design a washcloth? Lisa - It depends. I've done some in as little as a few minutes. Some take much longer. I've had a few haunt me for awhile, because I am obsessed with getting every detail I can into the pattern. I want people to be able to really see the picture. 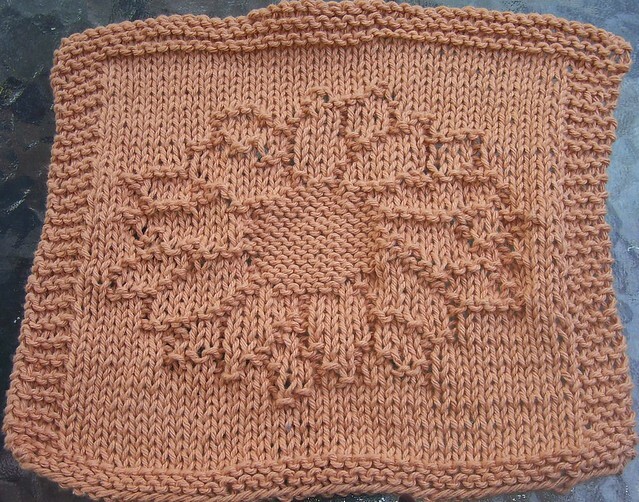 My favourite design of yours is the I Love Jane Austen washcloth, do you have a favourite? Lisa - One of my favorites is the Sunflower pattern. It was one of the first ones that gave me a really hard time to get it the way I wanted. Are washcloths your favourite things to knit? Lisa - Well they were for a very long time. I knitted them compulsively for about 3-4 years. I think I burned out on them. So I've been knitting cowls and scarves lately. The repetitive, mindless knitting relaxes me. Which knitted item that you've made are you most proud of, and why? Lisa - I am equally proud of all my knitted projects, but the ones that please me the most are the ones that teach me a new technique, or give me a new favorite stitch. If you could give us any piece of advice or a tip about knitting, what would it be? Lisa - Don't give up if you can't figure out something right away. If you get frustrated, put it down for a little while, and then go back to it. If all else fails, there's always a YouTube video that will be able to show you what you're doing wrong. I've learned many things using the videos available there. Head on over to Lisa's awesome Ravelry pattern shop, Digknitty Designs, then leave a comment below telling us which pattern you'd love to win. Please also leave your ravelry username in the comment, or an email address I can reach you on! I will leave the give-away open until next Sunday, then using a random number generator I will pick a winner! Don't worry if you don't win, Lisa has several free patterns available on her shop! I love Angel Kitty. thanks! I love to knit dishcloths. I like the 9 Patch Quilt Block Knit Dishcloth pattern. Thank you so much.